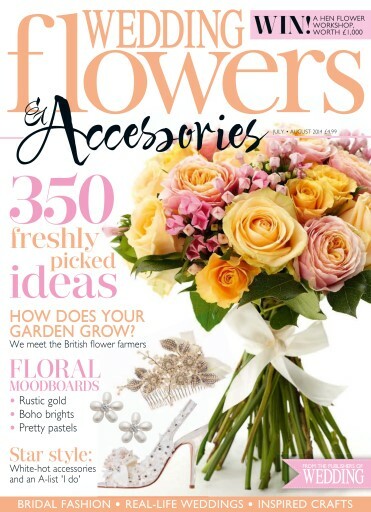 We have a brand new flower filled issue for you to explore. I love a celebrity wedding, so when Poppy Delevingne married James Cook in a Chanel Couture gown embellished with flowers, our fashion team excitedly went shopping to bring you ideas on how to get her Celebrity Style (page 12). Talking of trends, we’ve foraged all the hottest flower shapes of the summer on page 14. Once you’re armed with inspiration, you can find design tips and all the wisdom of the workshops on page 114. Still looking for a floristt? Read our Pick of the Bunch feature to find yours (page 116). Our real-life weddings section (page 33) really is all things bright and beautiful, featuring one of my favourite bridal designers, Charlotte Balbier’s pretty-in-pink big day. Finally, check out our brand new Wedding Flowers & Accessories Facebook page and don’t forget to join us on Twitter (@wedflowersmag) for #flowerfriday each week between 4-5pm. Whatever your wedding flower choices, long may they bloom!